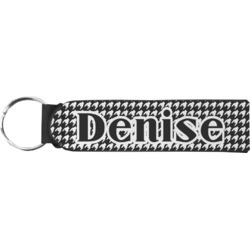 If you're on the go and need to keep your hands free, our personalized neoprene wristlet keychains will work great for you!! They look pretty and will keep your keys on hand at any time. They are a great gift to give if you're looking for something small with big impact. They can also be used to hold on to your usb drive! These wristlets are comfortable, cushioned, and easy to slide over your wrist. They are slim and fashionable as well. The metal ring attached is easy to squeeze open when trying to attach your keys. They measure at approximately 4" wide and have a bit of stretch. You may want to measure your wrist to be sure it will fit smoothly. Be sure to remove the split ring to wash.
Get into the design center to start creating an adorable wristlet! Be sure to be aware of the text and graphics you choose while designing. Since this product is rather small, be sure to choose a larger font or graphic. Have fun designing as you look through our thousands of design elements. Give us a call if you need any help! Be sure to check out our whole section of personalized Keychains to be sure you know all your options. You will love our genuine leather keychains and our webbing keychain fobs. Every household needs a good key hanger to organize your keys as well! The ladies out there may even be interested in our leather wristlet wallet as well. Not only can it hold your cellphone, but can easily clip onto your keys as well. The plus side is that it fits my wrist so I can keep my keys handy when necessary. The down side is that with the black backing it makes the front gray looking, so it looks dirty. I was disappointed. The print (of course) is also VERY tiny. Not the highest quality product, but the printing came out really nice. I like it because it has some give and stretch to it. The type is not very big, but it's a beautiful fob. I'm a dog sitter and I have client keys on it. It's great.